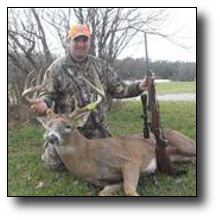 The story of this deer hunt starts out in September 2010, when my hunting partner and I decided to join HSP based on the recommendations of another member. The major disadvantage for joining late in the year is you miss the early reservations for the Missouri deer rifle season. Many of the "cream of the crop" farms were reserved. So we just decided to pick a remaining farm in an area that we've had success in the past, and hope for the best. After choosing a farm we headed up to take a look the day before rifle season. Once we were there we just more of less observed and actually ended up seeing a good buck in the 140" to 150" range dogging a doe. We started planning how we were going to hunt this farm when the phone rang. It was Angie from HSP who called to tell me about a late cancellation on a farm near us, to see if we were interested. We decided to swing by and take a look, and the feeling was mutual that though the acreage was smaller (still pretty big). This farm offered more hunting options. So, after changing all the reservations we made a mad scramble to get three ground blinds setup. The plan being to use the aerial photo in our hand book to find and hunt areas that had the most "stuff", meaning ditches, brushy draws, fence lines, coming together in one spot within gun range on a relatively open farm. The first two setups went quickly, but mine was last and on the way to where I wanted to go we ran smack dab into a mature buck tending a doe. It was almost dark and we chose to back out and I would come back to this field at daylight the next morning. Having killed a good buck like this one, two years ago, I knew that it was possible that these two could still be close by in the morning. The next morning I watched the sun come up in that field, but those deer were gone. I continued on to my original destination. I had only a bag chair, not wanting to pack the clumsy ground blind around before daylight. So when I finally arrived I decided to get high on the hill overlooking the spot where I expected most of the deer movement to be. Not being totally sure of how the deer moved on this farm and my hunch was right. While most of the deer did use the brushy draw at the bottom of the hill, there was a secondary trail 200 yards up the hill that a few deer used. At 10AM, I went back to the truck, grabbed my blind, went back out and set it up 250 yards up the hill from the brushy draw, keeping that secondary trail 50 yards in front of me. I have to admit, I didn't know if it would work, because I was kind of out in the middle of nowhere with this thing. Then, around 4PM I noticed that shots from surrounding farms started increasing. I could see deer running across the neighboring farm. Then I saw deer wandering around on our farm. I looked to my left and saw a good racked buck walking up that secondary trail, and as I raised my gun he saw my blind and started to bob his head up and down, just staring at me. After a few seconds he accepted it and continued on his way. That is when I shot, dropping him in his tracks at 45 yards. His green gross score was 151" as a nine pointer, and one of my best bucks ever! P.S. Thanks for the phone call Angie!